October 25 (Sunday) - SM City Rosales The Activity Center (Pangasinan). Already, Move on Philippines has expressed their support by providing books as prizes and motivation gift for contestants and winners. Modelizta Philippines will provide for entertainment through the special appearance of Goin Bulilit Kids Joshua, Yulio, Barbie and CJ. Other promising sing & dance groups Pinay Barbies and Charmers will also perform. The event will highlight the importance of literacy and reading skills as tools for achieving a better life. 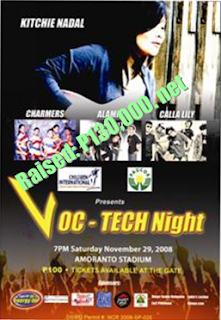 Bituen previously organized the Voc-Tech Night for Children International's Quezon City Agency and was able to raise an estimated P130,000 for the vocational and technical scholars from marginalized families. For Sponsors (interested to campaign, promote product or company), retailers (who may be interested to join the weeklong -October 20-26 -tiangge at SM City Rosales), or donors (for motivation gifts and prizes), you may send email or call Bituen at (63-2) 455-1132 for details or inquiries.